1. It is the last day of 2018. As we reflect go the year behind us, here is hope that 2019 will be much better for all of us. 2. I find it hard to believe that my end of the year vacation, eleven days off, is coming to an end after tomorrow. I have very much enjoyed being off from work, but I am ready to get back into the thick of things. 3. It is good to get a few little projects accomplished around the house. There always seems to be something to do, but knocking a project off the list gives a feeling of accomplishment. 4. The NFL regular season ended yesterday. Here is the final installment of the family NFL weekend results. It is is important to note that two of the family teams ended as Division Champions and are hosting playoff games next weekend! 5. 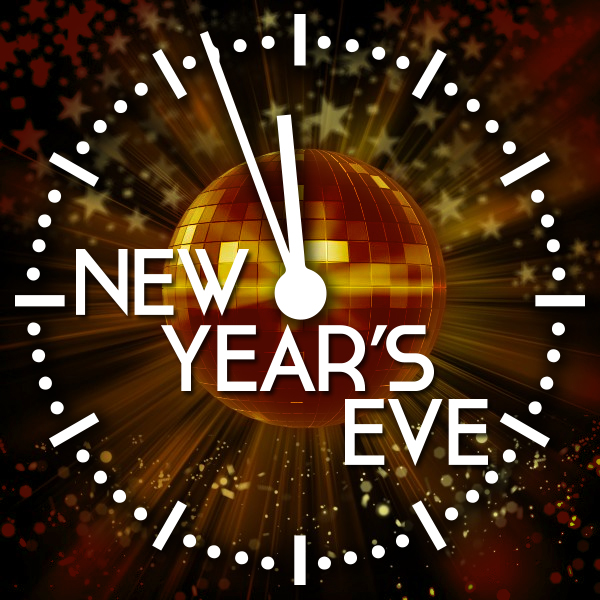 What are you doing for New Years Eve? Please be careful and do not drink and drive. Call a Lyft or an Uber. Most areas appear as if there will be rain. 6. When do you take the Christmas decorations down? This coming weekend will find our decorations back in the box for another year. 7. 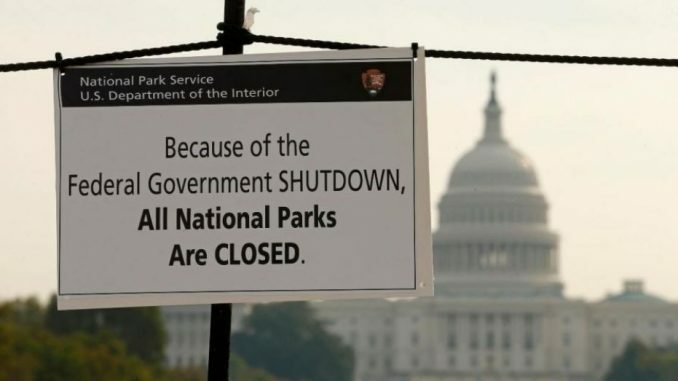 The government shutdown continues. It is unfathomable to me that they believe that they can run a country in this manner. Our leaders should be ashamed of themselves for their pettiness and lack of desire to lead the country forward while the rest of the world leaves us in the dust. 8. Today in History. On this day in 1999, the United States, in accordance with the Torrijos-Carter Treaties, officially hands over control of the Panama Canal, putting the strategic waterway into Panamanian hands for the first time. Crowds of Panamanians celebrated the transfer of the 50-mile canal, which links the Atlantic and Pacific oceans and officially opened when the SS Arcon sailed through on August 15, 1914. Since then, over 922,000 ships have used the canal. Today, we're taking a break from the concerns and the bustle of the work-a-day world. But we're also making a new beginning... Let us renew our faith that as free men and women we still have the power to better our lives, and let us resolve to face the challenges of the new year holding that conviction firmly in our hearts. That, after all, is our greatest strength and our greatest gift as Americans. With the arrival of great weather yesterday, we took the opportunity to make one last trip out to visit some wineries. It turned out to be a great way to spend the better part of the day and we also discovered another very enjoyable winery in the area. Chris and I took decided to drive about an hour away to visit some wineries. We love wine and enjoy going the wineries to taste the wines and talk to the wine makers about their work. Creating good wine is almost like an art form. Yesterday, we started by going to Big Cork Vineyard in Rohrersville, Maryland, to pick up the wines that had waiting there. 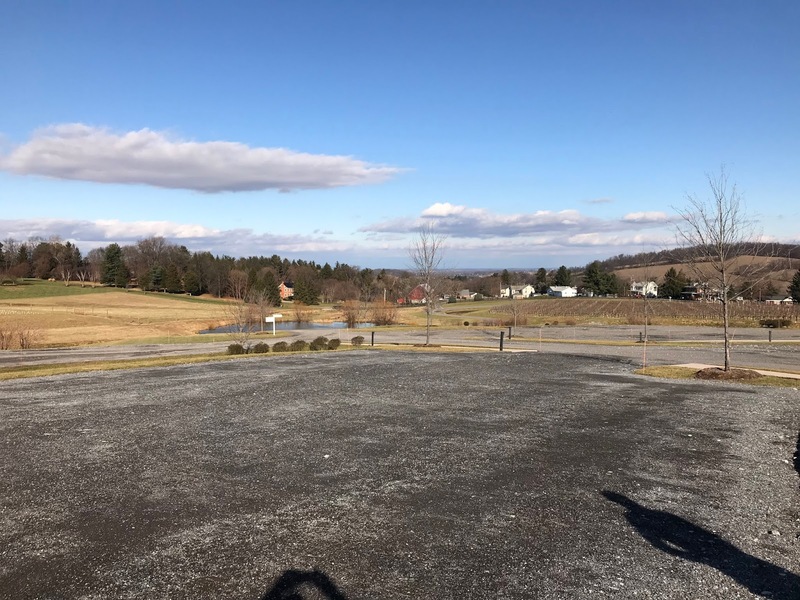 The winery is is a beautiful part of Maryland. It is very rural, similar to where we grew up in Upstate New York. After retrieving the wine and sampling the current offerings we set off for a winery in the area that we had not yet visited. 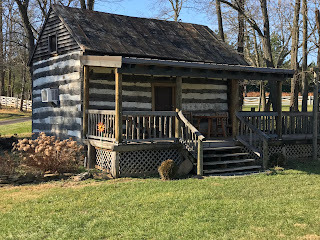 The second winery we visited was Hiddencroft Vineyards in Lovettsville, Virginia. The winery was housed in a late-1700's dairy farm which obviously had been updated. Many of the barns and buildings were original and very interesting. The wines were very nice as well. After sampling the wines, we bought a bottle and sat outside around the fire pit to enjoy some munchies and the wine. The day was surprisingly warm, still cold but warm enough to be comfortable near the raging fire. We met some other people and enjoyed the wine for about 45 minutes before deciding head back home. The beautiful day turned into a spectacular day of wine and friends and discovery. Well, it has happened, again. Washington is a shambles and the mess caused by the leadership is being borne on the backs of the Federal workers. Yesterday it was announced that there would be no 2019 pay raise although the formula for determining raises suggested a 2.1 percent raise. That raise would have just barely kept up with the rising costs associated with medical premiums, and the general cost of living. As it is, all federal workers will fall further behind. And some wonder why so many qualified federal workers are jumping to take higher paying jobs with contractors. All Smithsonian Museums and the National Zoo will close January 2, per NPR. The U.S. Department of Agriculture had announced payments for farmers who have been hardest hit by the U.S. trade war with China. But with the government remaining shut down for more than a week, some farmers may not receive their promised checks and won't be able to receive farm loans or disaster assistance, according to the AP. The Federal Trade Commission will need to suspend all investigations and litigation by Friday, including a high-profile investigation of Facebook. The Office of Personnel Management released a template letter Thursday for furloughed government employees to use to request smaller payments from creditors or landlords. One version of the letter included the suggestion that employees offer "the possibility of trading services to perform maintenance...in exchange for partial rent payments." The last one really hurts. Some brilliant senior government executive is suggesting that federal workers trade maintenance services for rent. Really? Think about that for a minute. Would you really want a furloughed federal worker fixing your faucet? They may be great as a security guard, but as a part-time plumber? They are skilled federal workers, and likely not trained maintenance people. Frankly, people do not join the ranks of the Federal government to be used as pawns in chess match between forces of government. That written, many Federal Workers are fortunate, so far, to be working for departments which have funding. Perhaps that is why this shutdown will last so long. Defense is so far unaffected, but the Coast Guard, on the other hand, is definitely affected. As are the people working for TSA and Customs. While demanding border security, the very people who work to secure the borders are being furloughed or asked to work without an expectation of receiving a paycheck. More than 420,000 federal employees across numerous agencies will continue to work even as the government shuts down. They just won't get paid for it immediately. Democrats on the Senate Appropriations Committee said that number will include more than 41,000 federal law enforcement and correctional officers from the FBI, the Drug Enforcement Agency, the Bureau of Alcohol, Tobacco, Firearms and Explosives, and thousands of other law enforcement and correctional officers. The vast majority of Department of Homeland Security employees will also work without a regular paycheck. The nearly 90 percent of workers in the agency affected by a shutdown would include 53,000 Transportation Security Administration employees, as well as 42,000 Coast Guard employees. As many as 54,000 employees from Customs and Border Protection — the agents who are currently working to secure the southern U.S. border — were also projected to work without paychecks. By forcing a shutdown over border security, Trump was expected to cause the agents he often lauds for their efforts to stop illegal immigration to temporarily go without compensation. Up to 5,000 Forest Service firefighters and 3,600 National Weather Service forecasters will also keep working without paychecks, according to Senate Democrats. Federal workers should not shoulder the brunt of the dysfunction in Washington. Amazingly, we had three nice weather days in a row. That does not happen much around here. I was able to take advantage of the nice weather yesterday and finally trim the grasses around the pool. I know it sounds kind of mundane and it is hard to get excited about cutting the ornamental grasses, but waiting until Spring when they have been crushed by the weight if the winter snow makes the problem even more difficult. The grasses make a very nice privacy shield during the summer months and their green is very pleasant to look at. During the winter, after they have bloomed, they become unsightly and they need to be cut before the new springtime growth can take hold. 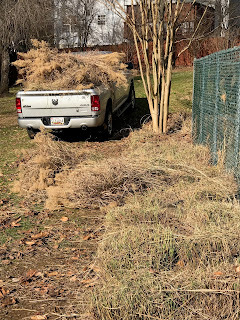 It is a big job and the truck can just barely handle all of the cuttings, but it is fun to strap down the mounded pile of grasses for the trip to the center where they will be turned into mulch. Now, the task is complete. I usually cut the grasses on Columbus Day and failing that Veterans Day, but the weather has been so bad that I didn't have the time I needed to allow them to dry before cutting and to have the ground dry enough to support the truck. I had the added benefit yesterday of a freeze which helped the still too moist ground support the weight of the truck. But the task is complete and now we can begin to accomplish other tasks. I still have a lot of wood to cut--so I guess that is my next task. Oh, wait--did I mention that it is raining, again. What a glorious December day yesterday turned out to be. The sun shone bright and I could feel its warmth on my face. It was cold in the shaded areas as Chris and I walked the dogs yesterday, but we still enjoyed being outdoors and not being rained or snowed upon. Despite the clear weather, however, it was very cool in the shade and after a time our hands got cold. So, we decided to head off to the mall and take care of a return or two. I realized that I had not actually been in the Columbia Mall since the beginning of the Christmas season. It was good to be in the mall with the other shoppers. Chris did an amazing job of navigating the return line at Macy's and then we were off into the main part of the mall. I love the mall because of all of the Poke stops--yes, I play Pokemon Go all of the time. It is a great way to pass the time. 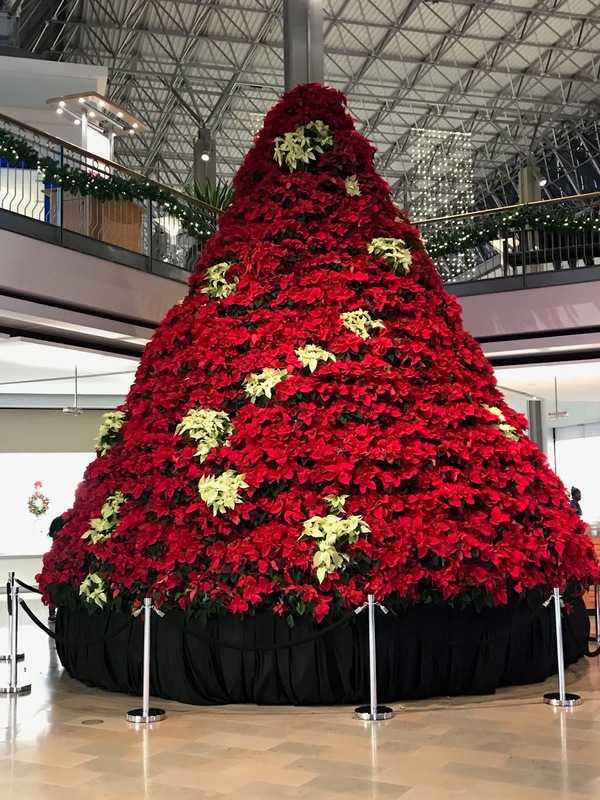 Most importantly, I was able to snap my annual image of the mall's poinsettia tree. I love the poinsettia tree. It is one of the most creative Christmas decorations that I can think of and it is the signature decoration of the Columbia Mall. Now I am ready for Spring. Oops, there is still most of Winter to get through. Some people believe that it is, but in reality we are a people of Christmas. 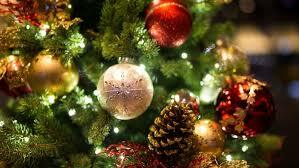 It is the Christmas spirit that lives in us throughout the year that sets us apart and makes us different. So, no, Christmas is not over--it remains alive in our hearts. It was a great day with family. Chris and I began the day alone, together exchanging gifts and enjoying the dawn of Christmas as it occurred. It was different for us, but very nice. The weather for the day was awesome, about as good as can be expected for a late-December day--clear and temperatures in the 40's. I know the cold weather is coming as January dawns. Once the family arrived, beginning doubt 1 PM, things really started to happen. 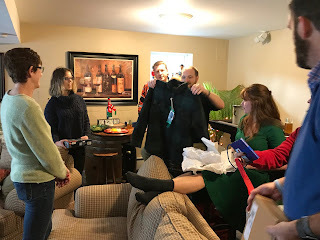 With dinner planned for about 4:30 and the meat in the oven, we conducted the gift exchange. 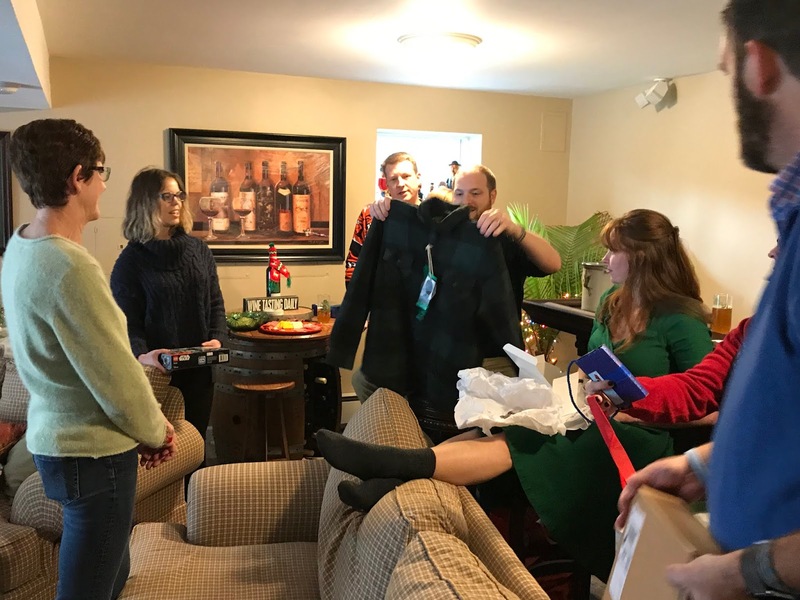 Gifts were exchanged and a good time was had by all. I have to confess, I do not have any returns! Yay! After dinner we played a few games and then people began to drift away home. It was a great family day together. 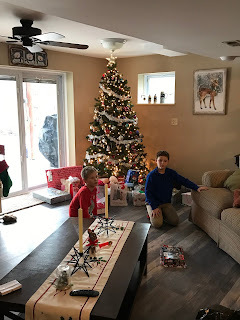 Another Christmas and another year. Christmas arrived last evening while Chris and I were watching The Polar Express. We save that movie for Christmas Eve. Sadly, last evening a tradition was broken, I did not read The Polar Express book to any of our children or grandchildren. 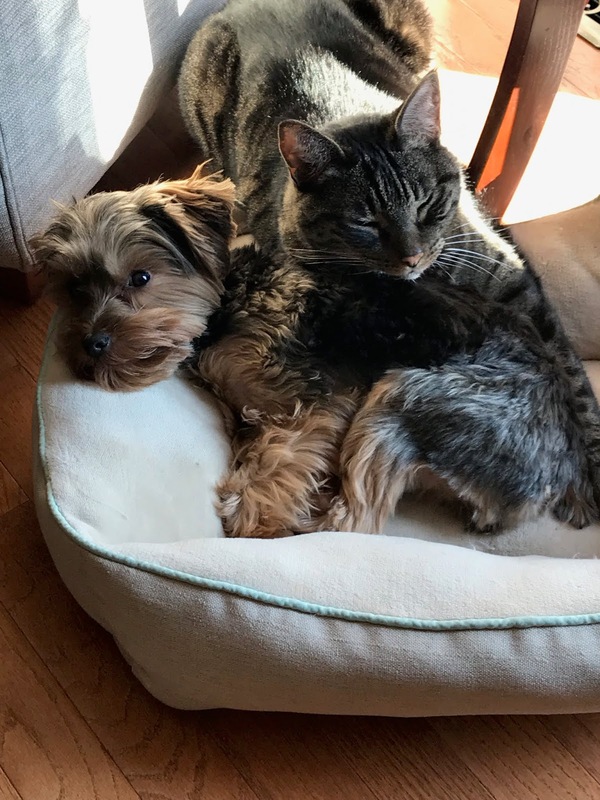 We had a busy Christmas Eve. Brunch was fabulous, everyone came and celebrated with us. That was followed by a quiet day culminating in church and then watching the movie. Some funny things happened the day progressed, yesterday. The animals brought a lot of joy to our hearts amid the wrapping preparations. 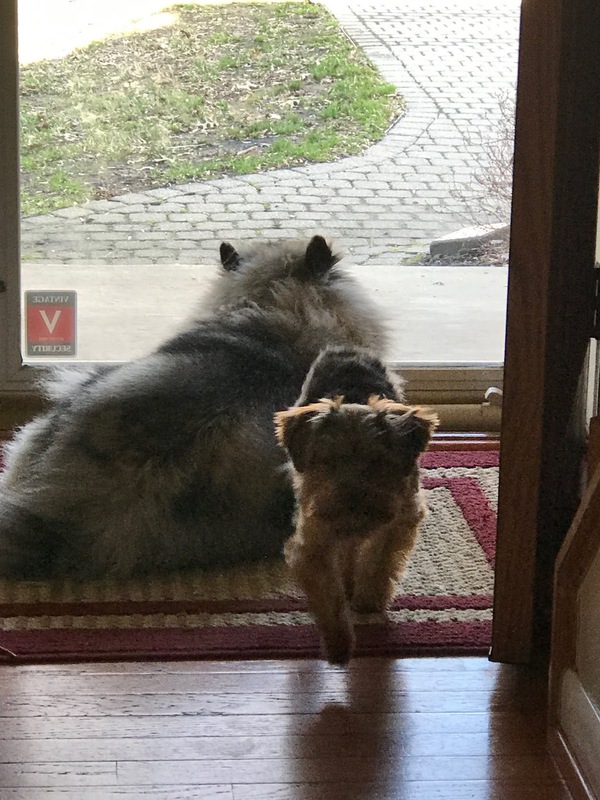 At one point both Makayla and Finnegan were looking out the door as if waiting for Christmas to arrive, unfortunately, Finnegan speed me with the camera and departed while I was taking the shot. And then there was the cat and dog sharing a sunbeam and sleeping together in Finnegan's bed. That doesn't happen often. Chris did a bit of last minute shopping and arrived with a new outfit for Finnegan. 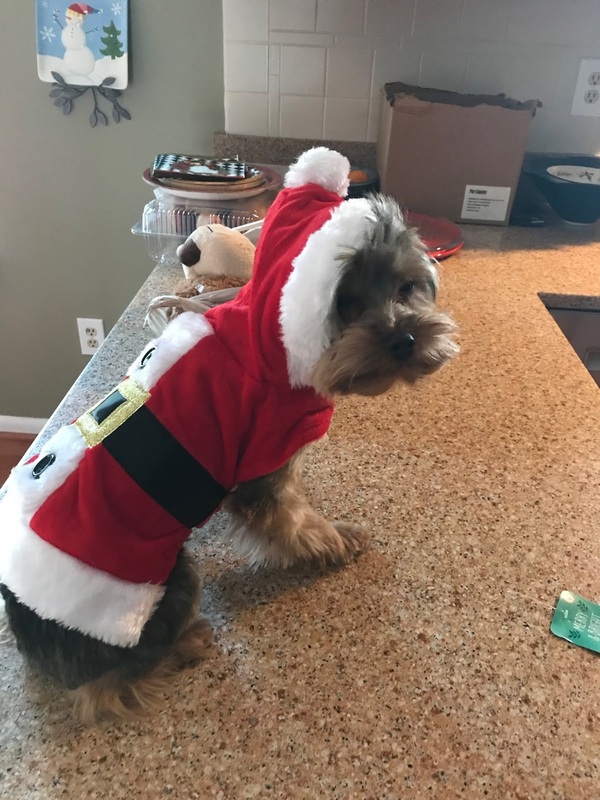 He was a trooper and tried it on, serving a Santa Paws for a brief time. It was cute, but not really becoming. The Christmas Eve message at church got me thinking. It was about how we have Americanized Christmas and it has changed from the original meaning of the day. The pastor made the comment that in Puritan America in the late-1600's that celebration of Christmas was outlawed. My how it has changed. The changes beginning during the first half of the 19th Century when Alabama and Louisiana became the first states to declare Christmas a holiday. But, that is a story for another time. Have a great and blessed Christmas Day. 1. Happy Christmas Eve. One week from today is the last day of 2018. 2. 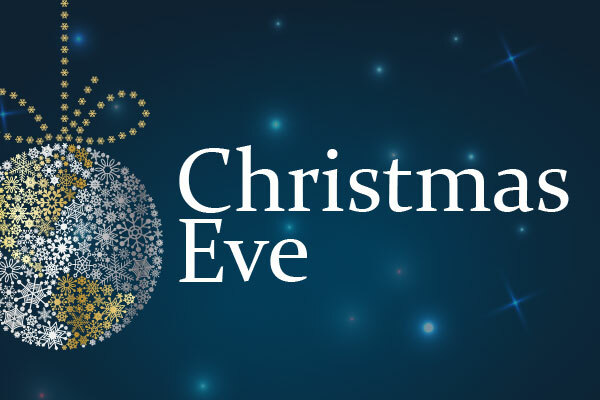 When I was a kid, I used to think that Christmas Eve was the longest day of the year, now it has become one of the shortest. The annual Christmas Eve brunch kicks off in a few hours and begins a day full of family and activity that ends in church tonight honoring the greatest gift mankind was given. 3. NORAD tracks Santa every Christmas Eve. 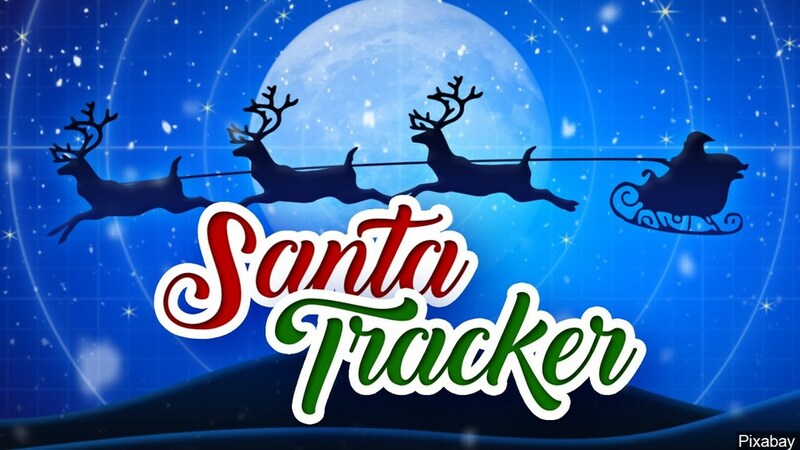 You can keep track of the annual flight at this web site: Santa Tracker. 5. 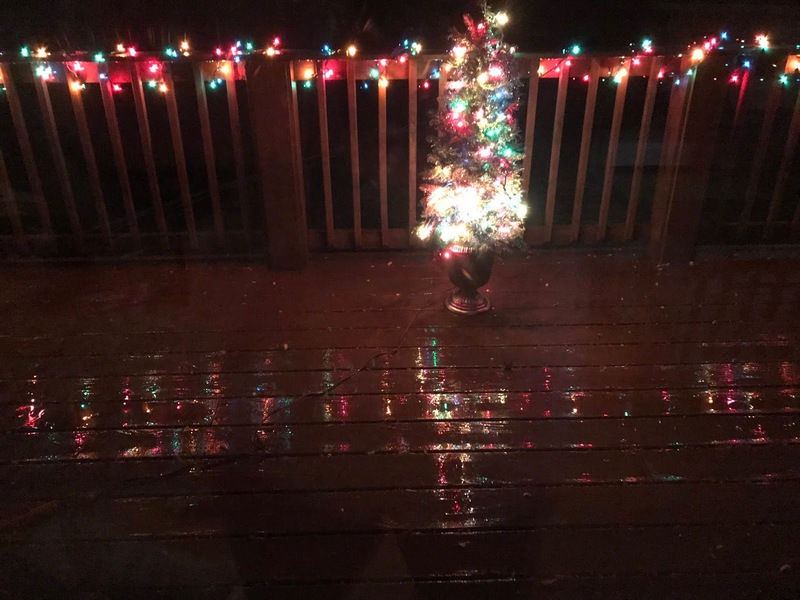 The idea of a White Christmas is overrated and a uniquely American view. 6. It will be sad to see all of the Christmas movies and music disappear for another year tomorrow. 7. The government shutdown is an atrocity. 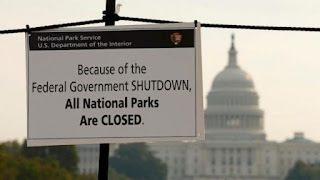 I have a hard time understanding why the shutdown is the democrats fault when the Republicans controversy both houses of the Congress until early-January. 8. Today in History. On December 24, 1979, the Soviet Union invades Afghanistan, under the pretext of upholding the Soviet-Afghan Friendship Treaty of 1978. Christmas is a time for children, and rightly so. We celebrate the birthday of the Prince of Peace who came as a babe in a manger. Some celebrate Christmas as the birthday of a great teacher and philosopher. But to other millions of us, Jesus is much more. He is divine, living assurance that God so loved the world He gave us His only begotten Son so that by believing in Him and learning to love each other we could one day be together in paradise. It's been said that all the kings who ever reigned, that all the parliaments that ever sat have not done as much to advance the cause of peace on Earth and good will to men as the man from Galilee, Jesus of Nazareth. May God bless you and your family this Christmas. May you find joy and may the love that God shows us in his gift of his Son, who brings salvation and eternal life, fill you with peace and hope now and for the entire year ahead. The record setting rains have created a big problem for the area and I am not exempt. 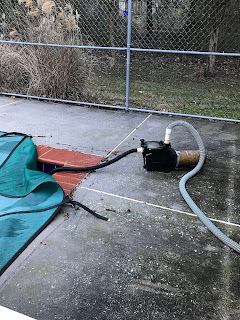 The pool has received so much rain that I had to set-up the auxiliary pump and remove seven inches of water from the pool to get the level back into the area I like to keep it to prevent ice damage during the cold days ahead. And then there are the grasses around the pool. 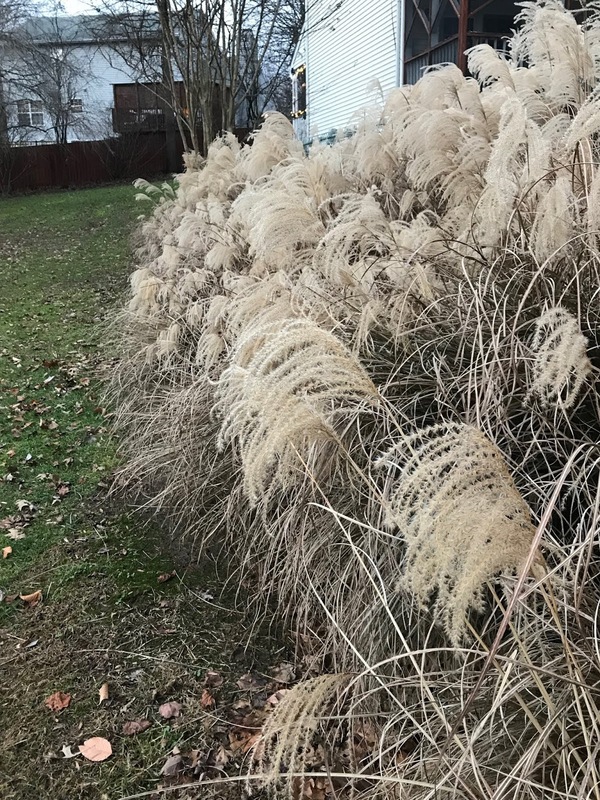 The ornamental grasses are usually trimmed on Columbus Day, or failing thwart Veterans Day--but both were washouts this year. 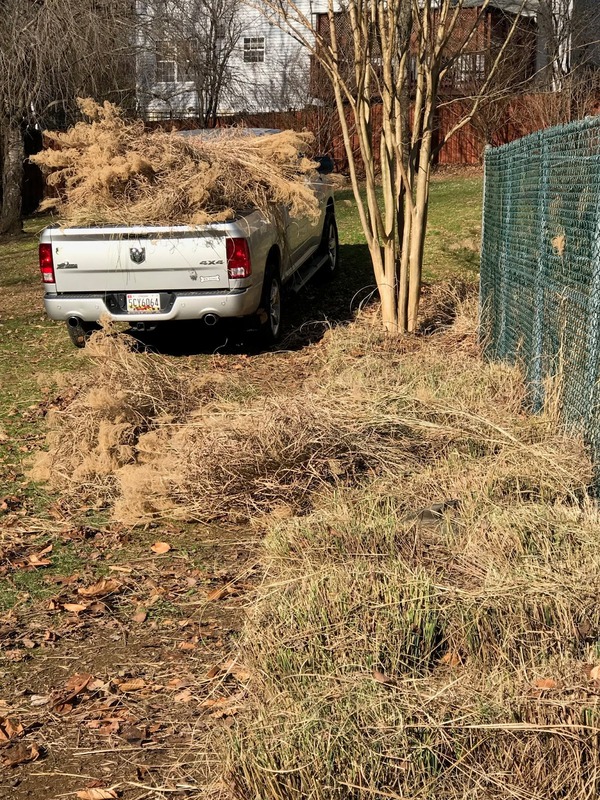 Hopefully, the lawn will dry enough this week to allow for the use of the truck to collect the grasses and remove them to the mulching center. Even during the Christmas season while shopping for gifts. I did, however, complete my shopping yesterday accompanied by hundreds of my new friends. I was very quiet about yesterday at it approached. It is one of those days that I try to forget about and just get it behind me. But I am now celebrating, sort of. Winter began officially at 5:23 PM EST last evening. I was on U.S. 1 driving to celebrate happy hour with friends when the event occurred. It slipped in unnoticed. I do not celebrate the arrival of Winter. 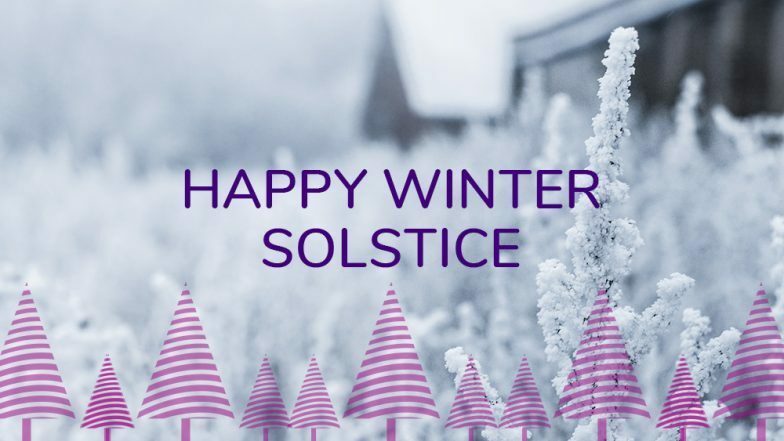 The arrival of Winter means that yesterday was the shortest day of the year. In Baltimore we had 9 hours 24 minutes and 1 second of daylight. Today will be all of 1 second longer. In Ithaca, NY, they only had 9h 4m 4s of daylight. In Charlottesville, VA, the day was 9h 31m 26s long. In Key West, FL, it was 10h 36m 57s. 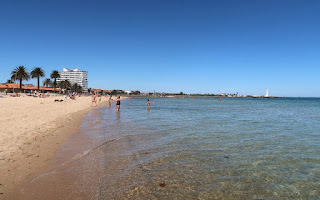 In Melbourne, Australia, conversely, they are blessed with 14h 47m 27s of daylight today (because it was already today when Summer arrived there). It could be a beach day, but the high today is only going be 74 degrees. Thursday looks like a great day though with a high of 95 degrees and partly sunny skies. So why am I celebrating? The dark season is half over! 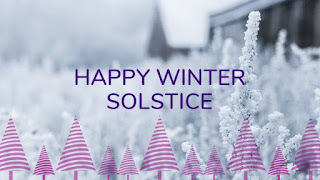 Days grow longer in the Northern Hemisphere from now until the next solstice in June! Summer is less than half a year away again! That is a cause for celebration. 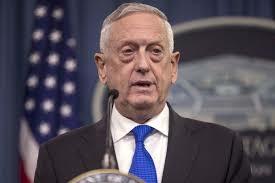 In one of the saddest commentaries on the current administration in Washington, the highly respected and decorated Secretary of Defense is resigning leaving a huge hole to fill. Secretary Mattis's sudden resignation is the latest, and most visible, sign that the Trump administration is in a shambles. That is bad news for all of us. 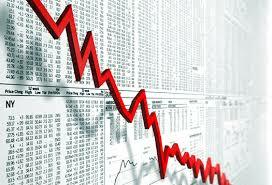 A stock market that daily looks for a new low and had made 2018 into a terrible year for investments. A revolving door for critical cabinet positions. Inconsistent policies that place our international allies at risk. The insistent and sometimes irrational demand for a wall to "secure" our borders, yet the funding is going to continue an economic catastrophe that we will be trying to recover from for generations. We are on the brink of disaster. When the government cannot recruit and retain qualified and respected leaders it is a definite sign that there is something wrong. I am reminded of Nero fiddling while Rome burned. Granted, the fiddle did not exist then, but the meaning is there. The forecast is for rain! Again! There were some forecasts as late as yesterday which were predicting dome possible snow for Christmas eve which would have made the sentimentalists happy with the remote possibility of waking to a white Christmas. The current forecast does not have any chances of snow for Monday evening. 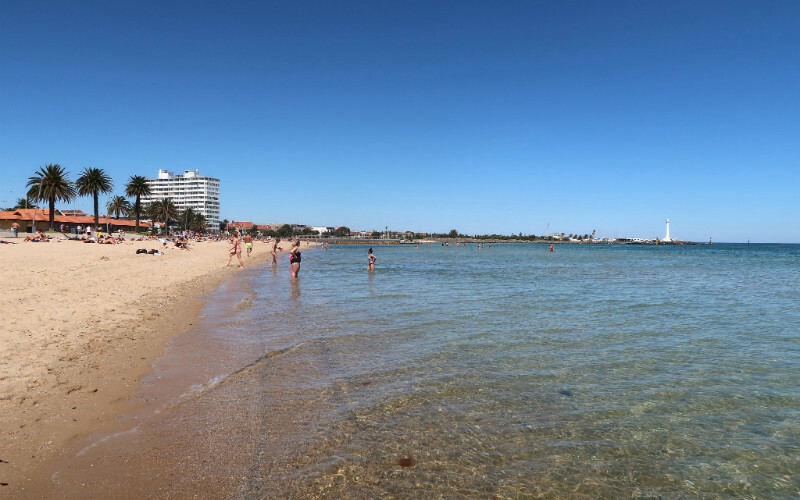 Of course, where Would rather be living the chances of a white Christmas are less than zero. So be assured, I am not one of those sentimentalists. Just to add some pain to the coming days, however, the temperature is expected to get up to 60 degrees on Friday, but the rain will preclude any outdoors activity! Ugh! What a combination of weather we are enjoying: warm and rain or cold and sunny. 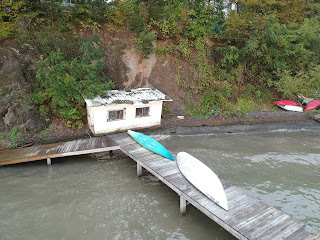 I hope the impending rain does not complicate the travel plans of many people. I was hoping to get some golf in during the Christmas holiday week, however, unless I travel somewhere warm, that is definitely not going to happen. 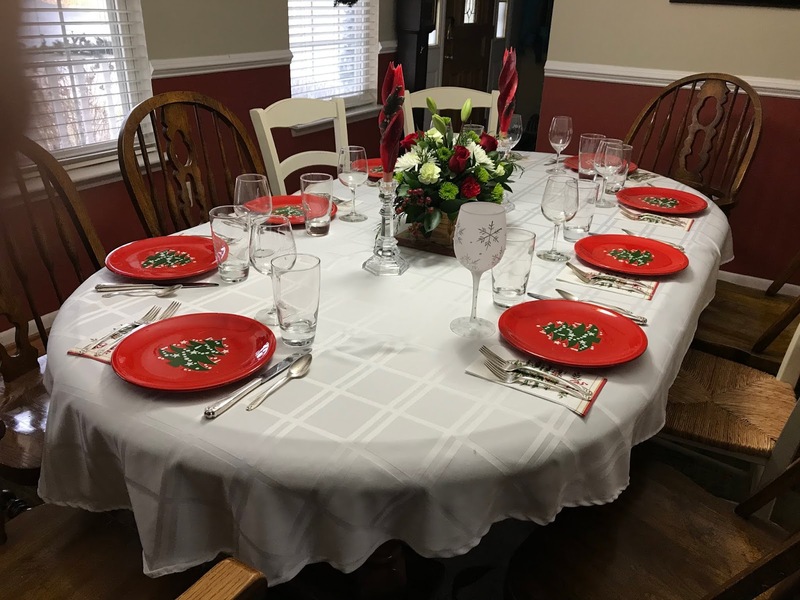 The Christmas season is winding down and there is so much to do in preparation for the main event. There is shopping to be finished, menus to be planned, and Christmas cards to be sent, which have not even been bought yet. I'm thinking we are going to send Happy New Years cards this year. So, with that preface what did I do last evening? Yup. 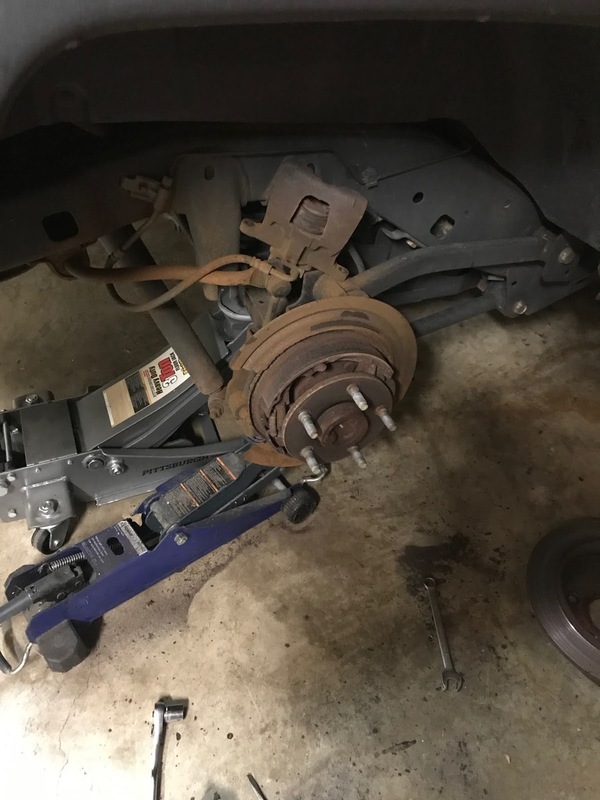 In the garage, in the cold, fixing brakes that should have been replaced about 10,000 miles ago. One of the brake pads had totally disintegrated and the caliper piston was in direct contact with the rotor. 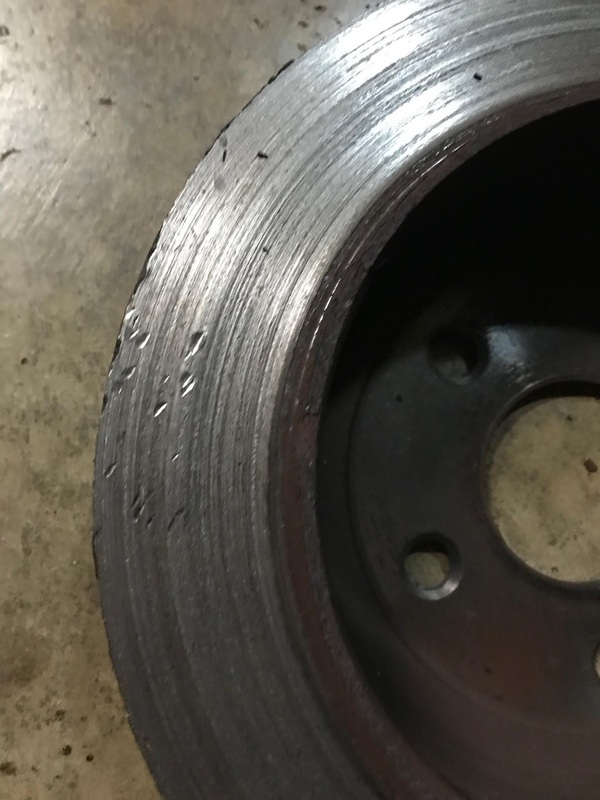 Needless to say, the caliper had to be replaced along with the rotor and brake pads. It was the rear brakes, and they are never easy to deal with because of the emergency brake, but in this case they came apart pretty well. 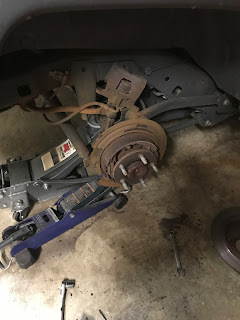 Because there was a break in the action to purchase a new caliper, to project took about three hours from start to finish. The Jeep, however, is now road safe again. That was my last Tuesday before Christmas activity. The final week has arrived before Christmas Day bursts forth o the scene. I am sure there are many people looking forward to it being over, but Christmas Day is only the beginning. Chris and I are in the middle of deciding upon menus for our Christmas Eve brunch and Christmas Day dinner. I know that the excitement is growing for the kids and many adults alike as Christmas draws closer. It is part of the season. It is funny, however, Chris and I are already in the middle of returns. It seems that while ordering on Amazon is easy, sometimes it is not easy to ensure I get the right item. I guess I am particularly poor at ensuring that I select the correct colors and combinations. Oh well, what is a little extra for shipping? So, what do you want this year? Or, is your joy in giving? For Christmas this year, as a Federal employee, Santa is bringing me a year without a pay raise and a leadership so embroiled in conflict that they are failing to lead the country by playing brinkmanship and planning for a partial government shutdown And, at no extra cost, Santa is bringing us a stock market that is crashing and sucking our retirement accounts down the drain. I'm not just a little bit disturbed about what is happening in Washington. But, I need to focus on Christmas--the season and the reason. I will live in the joy! 1. Christmas Eve is one short week away. 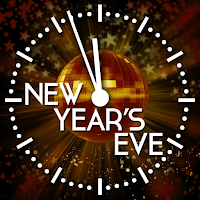 New Years Eve is just two short weeks away. Get ready and let the celebrations begin. 2. The dreary skies of the past few days are especially disheartening. 3. 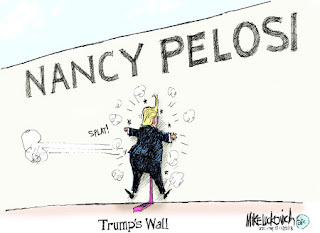 I was able to watch some of the exchange between Nancy Pelosi and the President the other day. While I am not a fan of Nancy Pelosi, the political cartoon that I found sums up the exchange pretty well. 4. 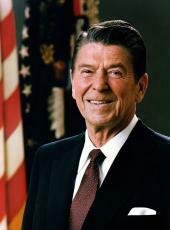 It is sad that closing the federal government has become an accepted political approach to problem solving. Funny thing is, the Republicans control the government right now. They are fighting amongst themselves. 6. I ventured out into the shopping arena surrounded by throngs of my new best friends on Saturday. It truly was a scene of chaos and commotion. Shopping on line while sipping a beverage with my feet propped up is far more pleasant. 7. There is a comet on tap for the Christmas season. Although it was brightest over the weekend, we were socked-in by clouds in the Baltimore region. Find the comet by reading the article about the Christmas comet. And then hope for clear skies. 8. I heard an interesting comparison regarding the periods in human development. There was the Stone Age, then the Bronze Age, the Iron Age, the Space Age, and now the Plastic Age. We are polluting the oceans with plastic. 9. Today in History, 1903. Near Kitty Hawk, North Carolina, Orville and Wilbur Wright make the first successful flight in history of a self-propelled, heavier-than-air aircraft. Orville piloted the gasoline-powered, propeller-driven biplane, which stayed aloft for 12 seconds and covered 120 feet on its inaugural flight. Freedom is not created by government, nor is it a gift from those in political power. It is, in fact, secured, more than anything else, by those limitations I mentioned that are placed on those in government. It is absence of the government censor in our newspapers and broadcast stations and universities. It is the lack of fear by those who gather in religious services. It is the absence of official abuse of those who speak up against the policies of their government. -- Remarks Announcing America's Economic Bill of Rights, July 3, 1987, 10:06 a.m. at an Independence Day celebration at the Jefferson Memorial. December is passing day-by-day and as we are now past mid-month, the end of both the month and the year are in sight. On top of the December darkness, it has rained non-stop for the past 36 hours. The forecast is for continued rain well into the afternoon today. To escape the gloom of the sunless dawn, I downloaded some of the images from our early October wine tasting trip to Upstate New York. The images reminded me of warmer times, although not necessarily dryer times. It rained during that trip. 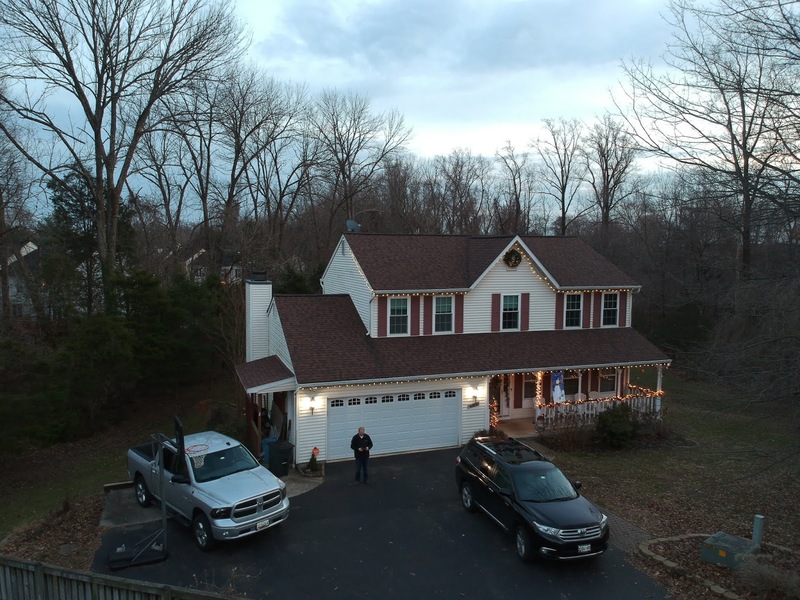 Despite the occasional rain, I was able to get Radio Flyer airborne for some nice images. 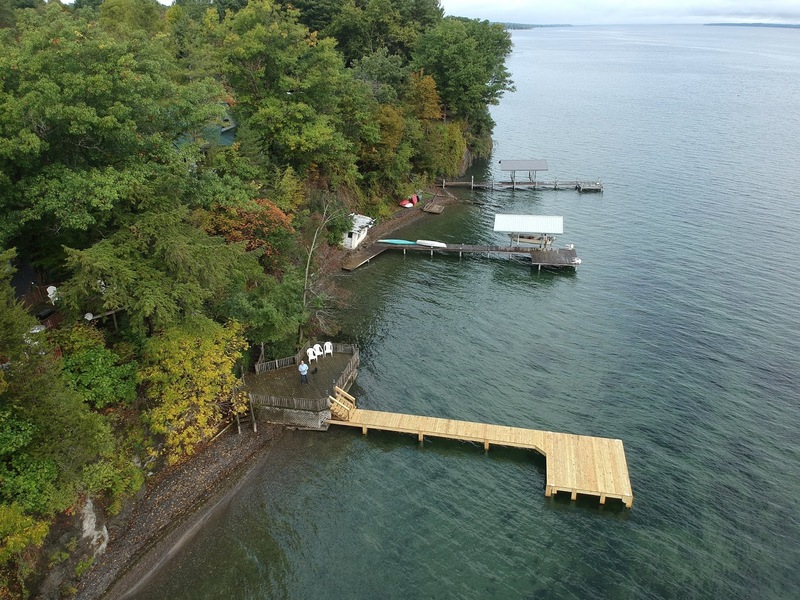 Flying over Senaca Lake was a new experience. It was fun, but I was also nervous because I knew that if there was an emergency and I couldn't get Radio Flyer back to short, it would be lost. Fortunately, there was no emergency, although the winds aloft did cause me to shorten my flight a bit and recover the drone. Remembering past trips helps me to escape the dreary days. December will be over soon and the new year will be full of warmer and drier days to enjoy. The rain has returned and dominates the weekend forecast. Ugh! We are expected to see temperatures in the 50's today, but the rain will preclude outdoor activities. 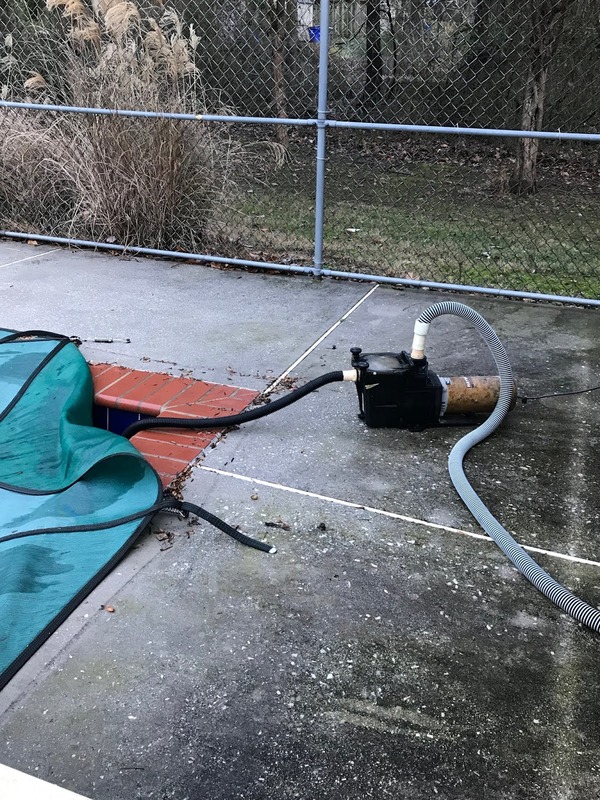 I have so many outdoors projects that need to be accomplished, including cutting the trees we had felled and trimming the grasses around the pool. But, even in the most disagreeable weather it is possible to find some beauty. Last evening as the rain fell, the Christmas lights illuminated the gloomy evening with their joyous light. I discovered some beauty on our back deck in their reflections in the rain. The reflections added much needed light to the season and brightened my mood, just a bit. For many reasons Radio Flyer, my DJI Spark UAS, has not been airborne since our get-away trip to New York during early October. Some of the reasons include the almost constant rain, the basement remodel project, the early onset of darkness since the time change, and the pace of life which has been incredibly busy with the arrival of the holiday season. 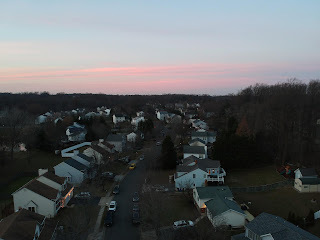 Last evening around sunset, I made a point of getting Radio Flyer airborne, even if only for a short nine minute flight. It was good to get the controls back into my hands and my drone into the air. 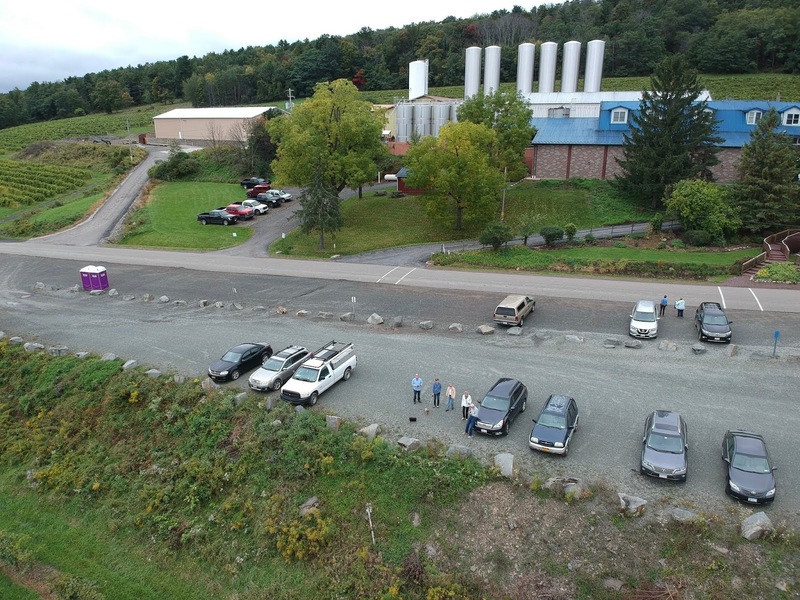 I was amazed at how many small things I had forgotten about flying the drone--mostly getting everything ready on the ground. But, they all came together and I had a successful flight checking out the Christmas lights on the house. 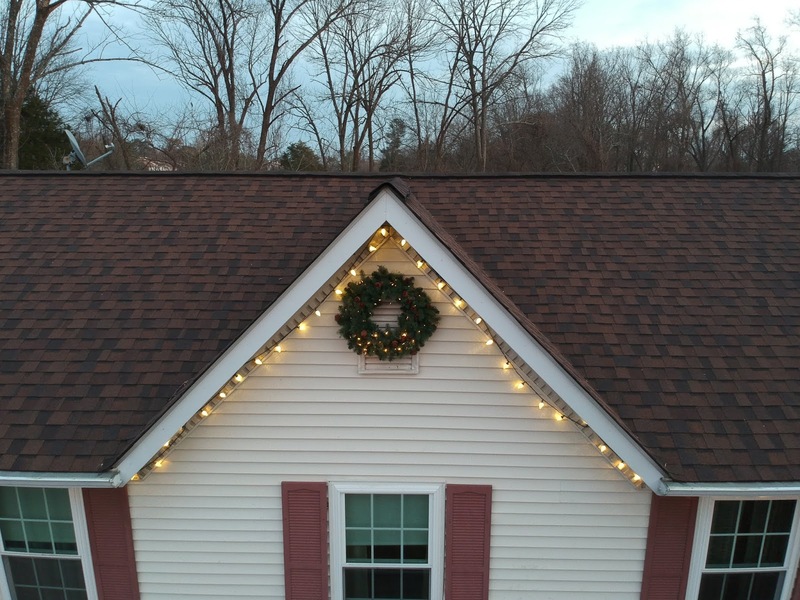 I was able to do a close-up inspection of the wreath at the peak and determine that I will likely need to change the batteries for its lights during the next nice day, whenever that happens. As an added benefit of the flight, I also downloaded some videos and stills from the October trip to the Finger Lakes from the memory card onboard the drone. It was a short flight, but I was happy to slip the surly bonds of Earth, even if only for a few minutes and through the lens of Radio Flyer. 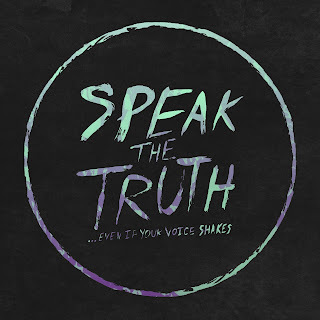 It dawned on me yesterday that our senior-most leaders are playing a game of truth or dare. Except, they are not telling the truth, ever, it seems. 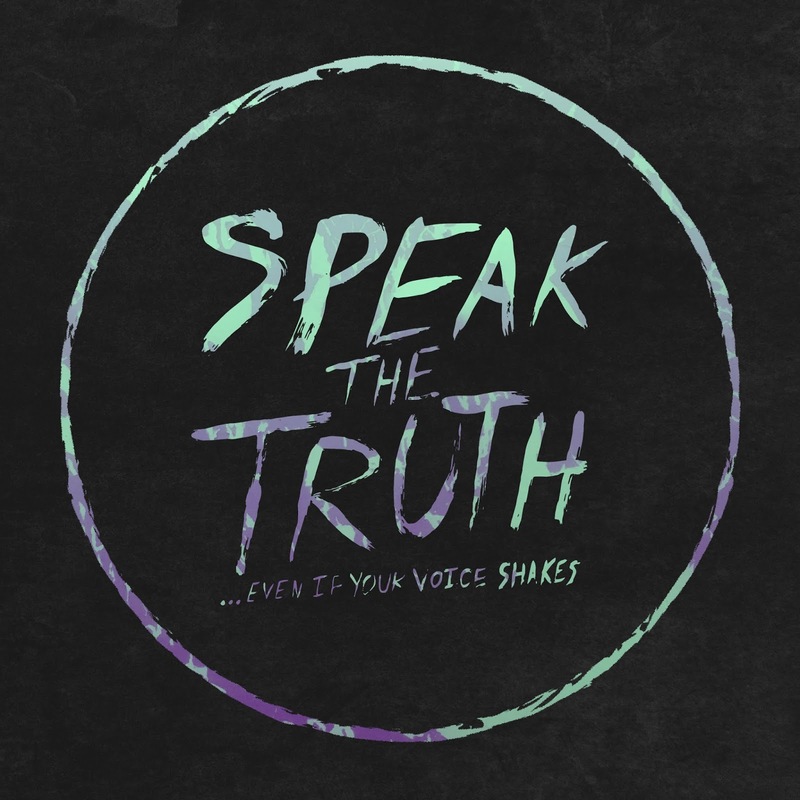 As I watch the news clips of how the truth evolves over time to meet the circumstances, I wonder how today's youth can possibly ever sort reality from fiction. It is appalling, really, how the truth is bent and distorted. The only good news in all of this is that the truth is finally coming to light through the ongoing investigations and that those who have lost their grip on truth are going to be spending time in prison or paying huge fines. It is not enough, but it is a start. I am appalled that a retired general and a respected lawyer have both bent the truth so blatantly. Maybe the truth will be uncovered in the end, I hope so. Last evening we celebrated Nicole's birthday. It is one of those major birthday's and we had a gathering at Lure's in Crownsville to start the evening. The food there was awesome as always. After that it was back to the house for presents and cake. What a cake it was. 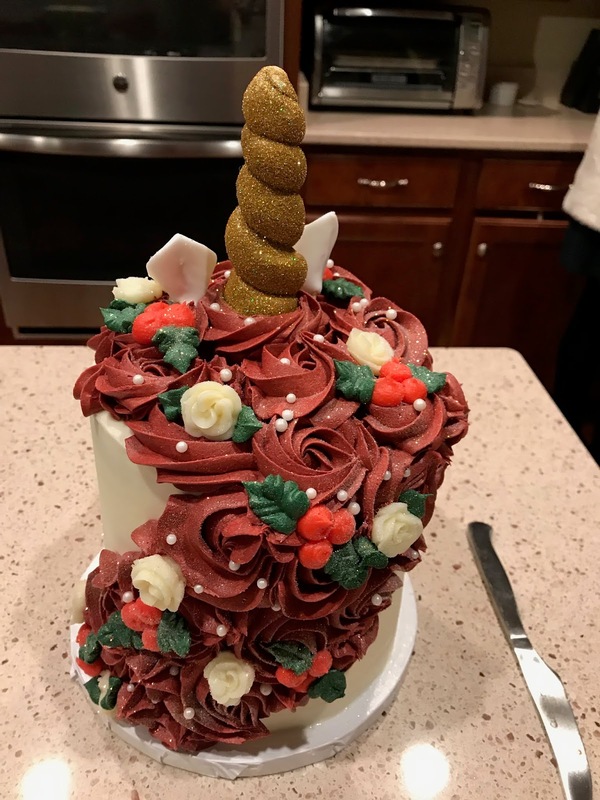 I have never seen such a fantastic cake--it was a unicorn. We had a great time reconnecting with friends and enjoying the celebration. But, the cake was truly spectacular--and it tasted good, too!